For other uses, see Proletariat (disambiguation). "Proletarian" redirects here. For the British communist magazine, see Proletarian (magazine). The proletariat (/ˌproʊlɪˈtɛəriːət/ from Latin proletarius) is a term for the class of wage-earners, in a capitalist society, whose only possession of significant material value is their labor-power (their ability to work); a member of such a class is a proletarian. The proletarii constituted a social class of Roman citizens owning little or no property. The origin of the name is presumably linked with the census, which Roman authorities conducted every five years to produce a register of citizens and their property from which their military duties and voting privileges could be determined. For citizens with property valued 11,000 asses or less, which was below the lowest census for military service, their children—proles (from Latin prōlēs, "offspring")—were listed instead of their property; hence, the name proletarius, "the one who produces offspring". The only contribution of a proletarius to the Roman society was seen in his ability to raise children, the future Roman citizens who can colonize new territories conquered by the Roman Republic and later by the Roman Empire. The citizens who had no property of significance were called capite censi because they were "persons registered not as to their property...but simply as to their existence as living individuals, primarily as heads (caput) of a family." 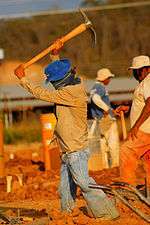 A manual laborer at work in Venezuela. Manual laborers are generally considered to be part of the proletariat. Although included in one of the five support centuriae of the Comitia Centuriata, proletarii were largely deprived of their voting rights due to their low social status caused by their lack of "even the minimum property required for the lowest class" and a class-based hierarchy of the Comitia Centuriata. The late Roman historians, such as Livy, not without some uncertainty, understood the Comitia Centuriata to be one of three forms of popular assembly of early Rome composed of centuriae, the voting units whose members represented a class of citizens according to the value of their property. This assembly, which usually met on the Campus Martius to discuss public policy issues, was also used as a means of designating military duties demanded of Roman citizens. One of reconstructions of the Comitia Centuriata features 18 centuriae of cavalry, and 170 centuriae of infantry divided into five classes by wealth, plus 5 centuriae of support personnel called adsidui. The top infantry class assembled with full arms and armor; the next two classes brought arms and armor, but less and lesser; the fourth class only spears; the fifth slings. In voting, the cavalry and top infantry class were enough to decide an issue; as voting started at the top, an issue might be decided before the lower classes voted. In the last centuries of the Roman Republic (509-44 B.C. ), the Comitia Centuriata became impotent as a political body, which further eroded already minuscule political power the proletarii might have had in the Roman society. Following a series of wars the Roman Republic engaged since the closing of the Second Punic War (218–201 B.C. ), such as the Jugurthine War and conflicts in Macedonia and Asia, the significant reduction in the number of Roman family farmers had resulted in the shortage of people whose property qualified them to perform the citizenry's military duty to Rome. As a result of the Marian reforms initiated in 107 B.C. by the Roman general Gaius Marius (157–86), the proletarii became the backbone of the Roman Army. Karl Marx, who studied Roman law at the University of Berlin, used the term proletariat in his socio-political theory of Marxism to describe a working class unadulterated by private property and capable of a revolutionary action to topple capitalism in order to create classless society. The term proletariat is used in Marxist theory to name the social class that does not have ownership of the means of production and whose only means of subsistence is to sell their labor power for a wage or salary. Proletarians are wage-workers, while some refer to those who receive salaries as the salariat. For Marx, however, wage labor may involve getting a salary rather than a wage per se. Marxism sees the proletariat and bourgeoisie (capitalist class) as occupying conflicting positions, since workers automatically wish their wages to be as high as possible, while owners and their proxies wish for wages (costs) to be as low as possible. A 1911 Industrial Worker publication advocating industrial unionism based on a critique of capitalism. The proletariat "work for all" and "feed all". 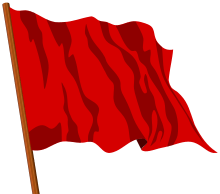 In Marxist theory, the borders between the proletariat and some layers of the petite bourgeoisie, who rely primarily but not exclusively on self-employment at an income no different from an ordinary wage or below it – and the lumpen proletariat, who are not in legal employment – are not necessarily well defined. Intermediate positions are possible, where some wage-labor for an employer combines with self-employment. Marx makes a clear distinction between proletariat as salaried workers, which he sees as a progressive class, and Lumpenproletariat, "rag-proletariat", the poorest and outcasts of the society, such as beggars, tricksters, entertainers, buskers, criminals and prostitutes, which he considers a retrograde class. Socialist parties have often struggled over the question of whether they should seek to organize and represent all the lower classes, or just the wage-earning proletariat. 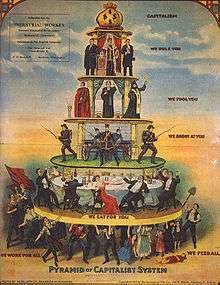 According to Marxism, capitalism is a system based on the exploitation of the proletariat by the bourgeoisie. This exploitation takes place as follows: the workers, who own no means of production of their own, must use the means of production that are property of others in order to produce, and, consequently, earn their living. Instead of hiring those means of production, they themselves get hired by capitalists and work for them, producing goods or services. These goods or services become the property of the capitalist, who sells them at the market. One part of the wealth produced is used to pay the workers' wages (variable costs), another part to renew the means of production (constant costs) while the third part, surplus value is split between the capitalist's private takings (profit), and the money used to pay rents, taxes, interests, etc. Surplus value is the difference between the wealth that the proletariat produces through its work, and the wealth it consumes to survive and to provide labor to the capitalist companies. A part of the surplus value is used to renew or increase the means of production, either in quantity or quality (i.e., it is turned into capital), and is called capitalized surplus value. What remains is consumed by the capitalist class. The commodities that proletarians produce and capitalists sell are valued for the amount of labor embodied in them. The same goes for the workers' labor power itself: it is valued, not for the amount of wealth it produces, but for the amount of labor necessary to produce and reproduce it. Thus the capitalists earn wealth from the labor of their employees, not as a function of their personal contribution to the productive process, which may even be null, but as a function of the juridical relation of property to the means of production. Marxists argue that new wealth is created through labor applied to natural resources. Marx argued that it was the goal of the proletariat to displace the capitalist system with the dictatorship of the proletariat, abolishing the social relationships underpinning the class system and then developing into a communist society in which "the free development of each is the condition for the free development of all". Prole drift, short for proletarian drift, is a term that suggests the tendency in advanced industrialized societies for everything inexorably to become proletarianized, or to become commonplace. This trend is attributed to mass production, mass selling, mass communication and mass education. Examples include best-seller lists, films and music that must appeal to the masses and shopping malls. ↑ proletariat. Accessed: 6 June 2013. ↑ Adolf Berger, Encyclopedic Dictionary of Roman Law (Philadelphia: American Philosophical Society 1953) at 380; 657. ↑ Arnold J. Toynbee, especially in his A Study of History, uses the word Proletariat in this general sense of people without property or a stake in society. Toynbee focuses particularly on the generative spiritual life of the "internal proletariat" (those living within a given civil society). He also describes the "heroic" folk legends of the "external proletariat" (poorer groups living outside the borders of a civilization). Cf., Toynbee, A Study of History (Oxford University 1934–1961), 12 volumes, in Volume V Disintegration of Civilizations, part one (1939) at 58–194 (internal proletariat), and at 194–337 (external proletariat). ↑ Berger, Encyclopedic Dictionary of Roman Law (1953) at 351; 657 (quote). 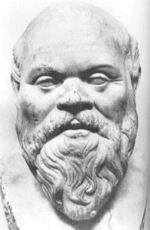 ↑ Titus Livius (c.59 BC-AD 17), Ab urbe condita, 1, 43; the first five books translated by Aubrey de Sélincourt as Livy, The Early History of Rome (Penguin 1960, 1971) at 81–82. ↑ Andrew Lintott, The Constitution of the Roman Republic (Oxford University 1999) at 55–61, re the Comitia Centuriata. ↑ Cf., Theodor Mommsen, Römisches Geschichte (1854–1856), 3 volumes; translated as History of Rome (1862–1866), 4 volumes; reprint (The Free Press 1957) at vol.III: 48–55 (Mommsen's Bk.III, ch.XI toward end). ↑ H. H. Scullard, Gracchi to Nero. A History of Rome from 133 BC to AD 68 (London: Methuen 1959, 4th ed. 1976) at 51–52. ↑ Cf., Sidney Hook, Marx and the Marxists (Princeton: Van Nostrand 1955) at 13. ↑ Marx, Karl (1887). "Chapter Six: The Buying and Selling of Labour-Power". In Frederick Engels. Das Kapital, Kritik der politischen Ökonomie [Capital: Critique of Political Economy]. Moscow: Progress Publishers. Retrieved 10 February 2013. ↑ Marx, Karl (February 1848). 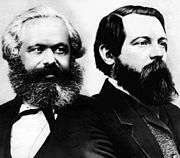 "Bourgeois and Proletarians". Manifesto of the Communist Party. Progress Publishers. Retrieved 10 February 2013. ↑ Fussell, Paul (October 1992). Class, A Guide Through the American Status System. New York: Ballantine. ISBN 0-345-31816-1. Blackledge, Paul (2011). "Why workers can change the world". Socialist Review 364. London. Hal Draper, Karl Marx's Theory of Revolution, Vol. 2; The Politics of Social Classes. (New York: Monthly Review Press 1978). Look up proletariat in Wiktionary, the free dictionary.